Rashtriya Janata Party chief Lalu Yadav pilloried Bihar Chief Minister Nitish Kumar for saying that there was no opposition leader strong enough to take on PM Narendra Modi in the 2019 general elections. Rashtriya Janata Dal chief Lalu Yadav mounted another attack on Chief Minister Nitish Kumar on Tuesday. 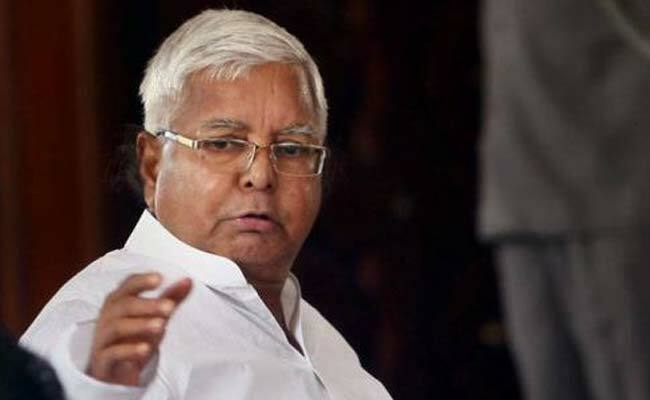 Lalu Yadav on Tuesday accused former partner and Bihar Chief Minister Nitish Kumar of being "greedy for power," calling him a palturam (turncoat) who lacks political character. Mr Yadav has continuously attacked Mr Kumar since last week when the latter dissolved their partnership and chose the BJP as his new ally. He ridiculed Nitish Kumar today for saying that there was no opposition leader strong enough to take on Prime Minister Narendra Modi in the 2019 general elections, asserting, "Keep shouting slogans in favour of Narendra Modi ... PM material (Nitish Kumar) has surrendered before him but we will have another face against him (Modi) in 2019." Mr Kumar was seen as a strong contender for the joint opposition's prime ministerial face in the 2019 elections before he dumped Lalu Yadav and the Congress, tying up instead with PM Modi's BJP in the state. The Chief Minister had also suggested that Rashtriya Janata Dal and the Congress had vastly benefited due to his leadership role in the 2015 Bihar assembly elections. Lalu Yadav, who hit back at him, underlined that he didn't really trust Nitish Kumar and had been reluctant to give him the lead role in the game-changing Mahagathbandhan or Grand Alliance ahead of the 2015 assembly elections which included Mr Kumar's Janata Dal United, the RJD and the Congress. But he agreed, Lalu Yadav said, at the insistence of the Samajwadi Party's Mulayam Singh Yadav to keep the BJP out. "I had said that even I have to gulp down poison, I will, to keep the communal fascist forces away," the RJD chief who has been seething with anger after Nitish Kumar last week resigned from the Chief Minister's post, only to form a new government with the BJP the next day. Mr Kumar has insisted that the RJD's refusal to make Lalu Yadav's son Tejashwi Yadav exit after facing corruption charges had driven him to bring down his government. In between, the Chief Minister also suggested that he had a reputation to keep and was expected by the voters to deliver on the mandate of good governance. Lalu Yadav has been questioning this narrative that pins the blame on his son and smears their reputation to end their political career that he had launched with the last assembly election. The RJD chief also challenged arguments that suggest his party and the Congress had gained because of their association with Nitish Kumar. Citing statistics on the voting pattern in the 2014 Lok Sabha elections, Lalu Yadav said the JD (U) won, or came second in just 39 assembly segments and lost its deposit in 135 assembly segments. "Yes, he has such a good face," Lalu Yadav added sarcastically. In contrast, the RJD had won, or came second in 150 seats and the Congress 34 when they contested alone.